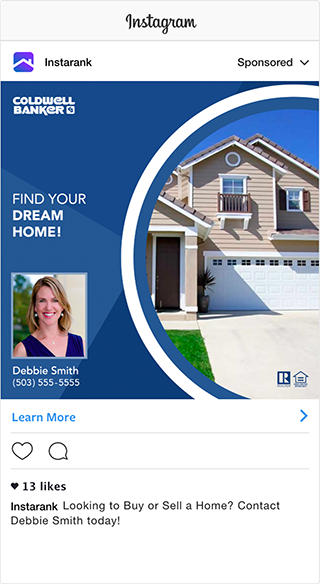 Appear on Instagram, in front of real buyers and sellers in your area. We help agents rise up the search ranks — and stay there. 60% of Instagram users say that they have learned about a product or service on the Instagram. Advertise where people are looking. Marketing dollars should never be wasted on guesswork. Using extensive market research, we put you in front of active and interested consumers in your local area. Every month, we send you a report with the success of your campaign. This data is used to increase performance month after month. You can customize your ad to fit your needs. Buyers and sellers who click on your ad will be sent directly to your website. Availability is limited in each area! Copyright 2018 InstaRank, LLC. All rights reserved.